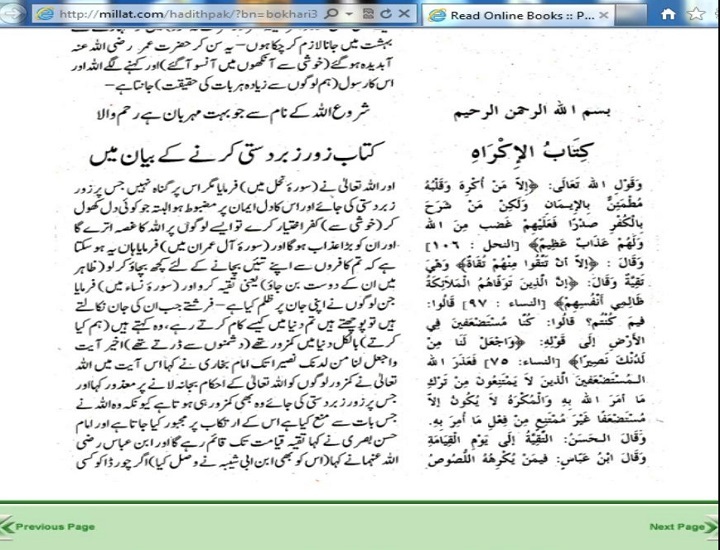 We want to provide online links from Bukhari (chapter saying something under compulsion).One link from Saudi Wahabi Official site, Other link from an Urdu site, Bukhari testifies that these verses of Quran about Taqqiyya and Taqqiyya is allowed until the day of judgement. We have also provided the screen shots from these two diferent sites. Unfortunately http://www.sunnah.com ate this narration of Bukhari as usual. Another site Millat.com, page number 812, the chapter “saying some thing under compulsion” starts from this narration. Those verses which Bukhari testified are (16:106) and (3:28) “The believers must not establish friendship with the unbelievers in preference to the faithful. Whoever does so has nothing to hope for from God unless he does it out of fear or taqiyah (pious dissimulation). God warns you about Himself. To God do all things return.” In this verse arabic word Taqqiyyah is used itself. 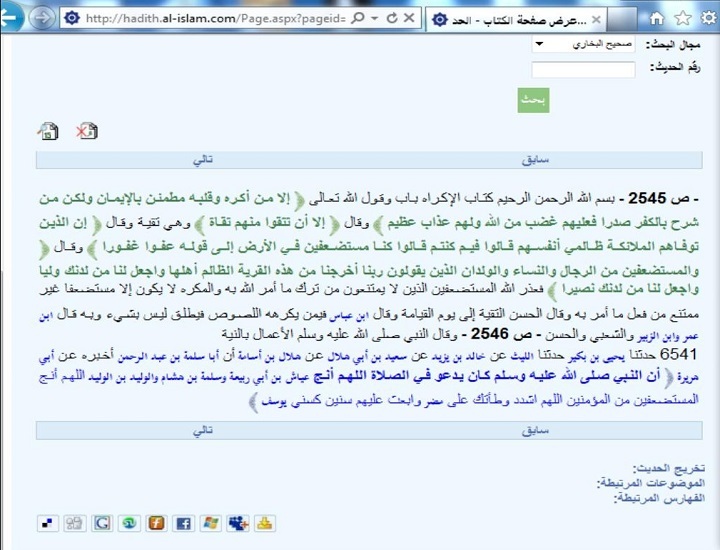 This entry was posted in Ahlulbayt, Taqiyyah in Bukhari and tagged 12 Caliphs, Abu Hurairah, Ahlalbait, Ahlalbyt, Bada’a, Bukhari, Caliphate, caliphs, Companions, Imam, Imam Ali, Imam Mahdi, Imamate, Immamate, Islam, khilafat, Mawla, Mutta’a, Nissaie, Prophet Muhammad, Quran, raja’ah, realislam, sahaba, sahih al Bukhari, sahih Muslim, sharia, shia, Shia belief about Quran, shia sunni conflict, shia sunni debates, shia sunni info, shia sunni similarities, shiaislam, shiasunni, shiasunni differences, sunni, Taqiyya’a, Taqiyyah in Bukhari, Trimdhi, Virtues of Ahlalbayt, Virtues of Imam Ali, Virtues of Imam Hassan, Virtues of Imam Hussain, Virtues of Lady Fatima, Virtues of Lady Khadija, Who are Ahlalbait. Bookmark the permalink.